Eating carrots regularly has many health benefits including improved eyesight, prevention of certain cancers, reduced cholesterol and reduced risk of heart attack. These benefits emanate from carrots’ fiber and beta carotene content. This vegetable is also rich in antioxidants, potassium and vitamins A, C and K. Carrots are easy on the tongue and have a crunchy texture. 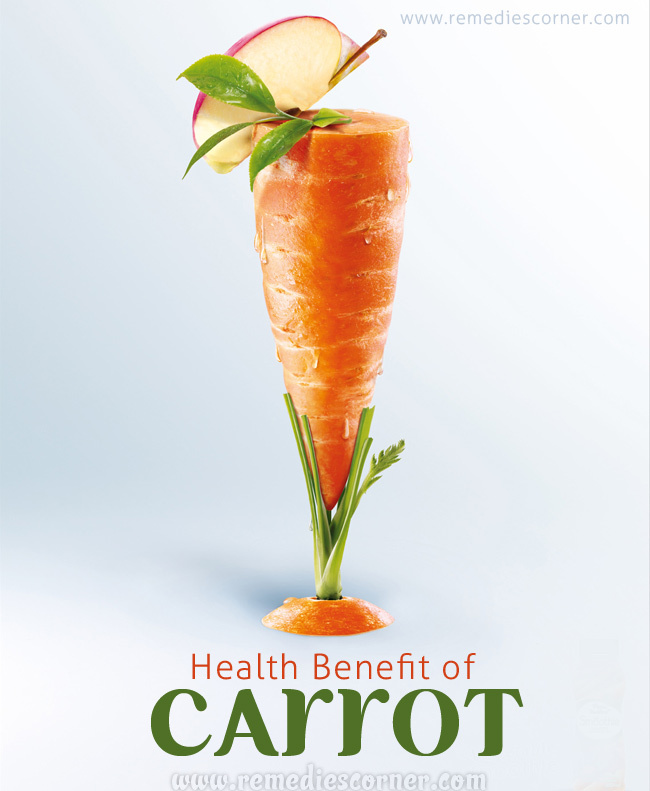 Read on to learn in detail about the various health benefits of carrots. Research reveals that carrot intake reduces the levels of cholesterol. High cholesterol level increases the risk of heart diseases. Another study in Sweden found that root vegetables reduce the risk of suffering a heart attack. This fact has been corroborated by an Italian study which found that eating carrots reduces the risk of a heart attack by 33%. Carrot eating can reduce the risk of certain cancers. This is because of their beta carotene content. Various researches have proved that consuming carrots can significantly reduce the risk of lung cancer, colon cancer and importantly for women, breast cancer too. This eye disease commonly occurs with age and affects seniors. Again, the beta carotene content of carrots helps, as carrot eating has been found to reduce the risk of macular degeneration by up to 40%. Improved eyesight is the most popular benefit of carrots. Vitamin A deficiency affects eyesight. Carrots are rich in vitamin A and hence this vegetable improves eyesight. Seniors should consume lots of carrots to prevent the occurrence of cataracts. Eating a single carrot every day reduces the risk of stroke by about 68%. This is because carrots have a positive effect on the brain. Stroke patients have a much better chance of survival if they eat carrots, because of this vegetable’s high beta carotene levels. Carrots are also highly recommended for diabetes patients because they contain carotenoids, which reduce blood sugar. The beta carotene content in carrots helps to fight the negative effects of aging. Carrots’ antioxidant properties fight cell damage in the body. Carrots are great for your teeth too. They stimulate the gums and remove the sticky plaque formed on the teeth. Carrots also stimulate plenty of saliva, which removes teeth stains. The rich mineral content in carrots prevents tooth damage by killing the germs present in the mouth. Carrots cleanse and detoxify the liver, thereby preventing acne which is caused by toxins in the body. Carrots also treat pigmentation problems which cause uneven skin tones. If you have dry skin, use carrot oil which makes the skin firmer, smoother and softer. The nutrients in carrots nourish the skin and prevent blemishes. The antiseptic qualities of carrots make them a good vermicide, laxative and cure for liver ailments. Carrot juice greatly improves gastrointestinal and stomach health. Carrot juice can greatly enhance your beauty. This vegetable’s juice prevents sunburn by acting as a sunblock. It also prevents skin wrinkles and effectively treats scars. Keep your skin glowing and well-toned by drinking carrot juice every day. These are various health and beauty benefits of carrots. Include this invaluable vegetable in your daily diet to improve your health and beauty.